First of all, the beauty of nature in my garden and around the place where I live with my family. 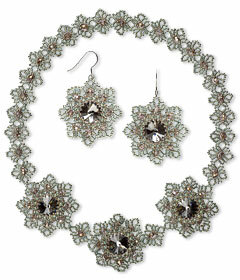 I love working with seed beads, pearls, crystals, gemstones of all kinds, leather, organza, Polymer clay and memory wire. Cameo... romantic and renaissance style. I simply defined it as I began working on the piece. I have been beading since April 2008 and I started with Easter Eggs. I am an autodidact. I was searching for information on the Internet and step by step tried different techniques. Not really, I am just a beginner. But I hope I have an artistic future. Currently jewelry-making is a hobby for me and is not a source of income. Maybe it will become more than a hobby in the near future. I just started to enter contests. Be creative and don't give up. If you are truly passionate about your craft and believe in what you are doing, the rest will follow. Be yourself, nothing less and nothing more, be as big as you want to be, and others will resonate with the purity of your expression.